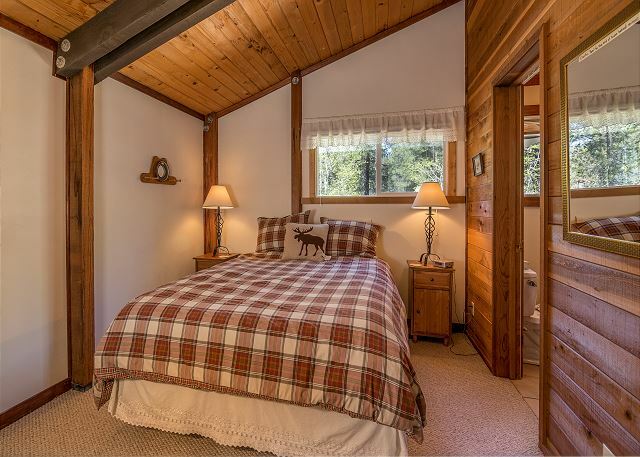 Vacation to Sunriver and stay in a 3 bedroom vacation home perfect for a family of 6 and a four legged best friend! The bedrooms are arranged each with 1 king, 1 queen and 1 set of twin/double bunk beds. The living room has a gas fireplace and the kitchen overlooks the dining area and living room. 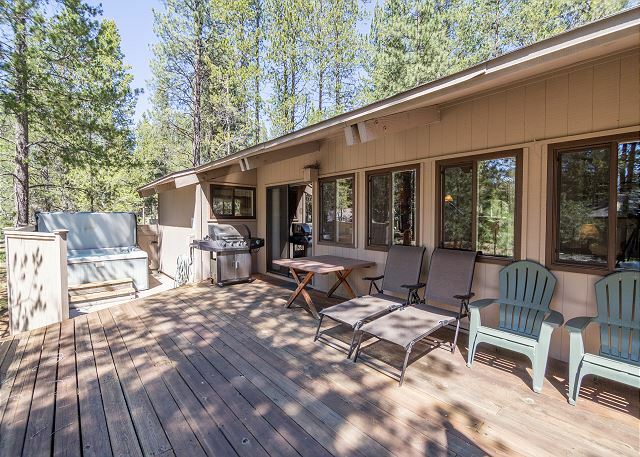 Deer Lane #2 has a large deck perfect for sitting outside while soaking up Sunriver’s year round sunshine. 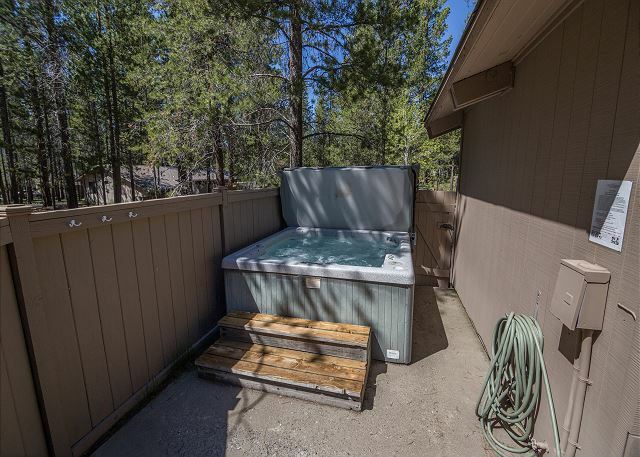 Relax in the private hot tub or take a bike ride! This home includes bikes and is near the Village Mall & Lodge. Walk to the mall for an all day shopping adventure and end with a meal at one of Sunriver’s local restaurants. 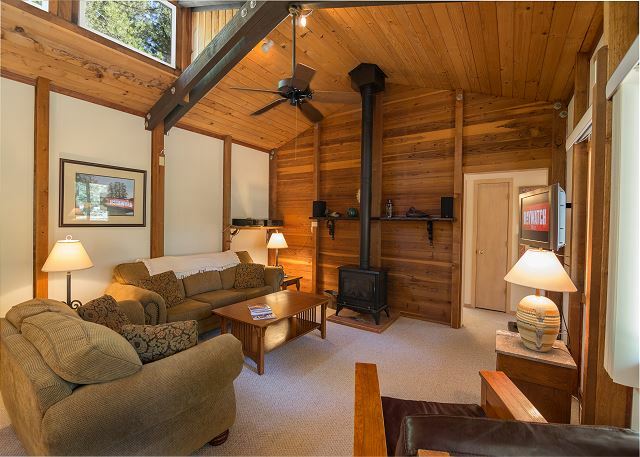 This home provides 6 Unlimited SHARC passes, free tennis and free access to the Sunriver Marina. 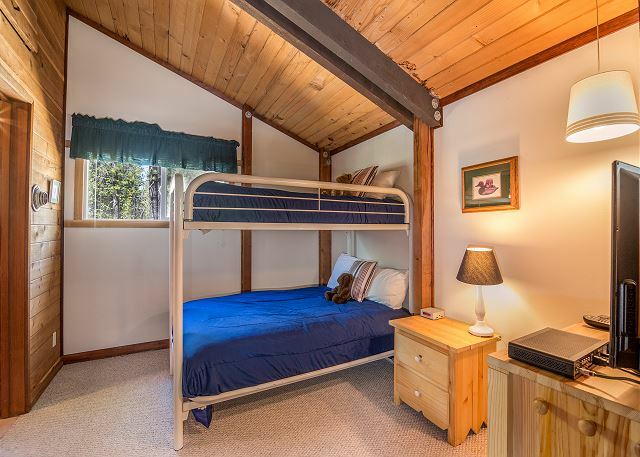 1 King Bed, 1 Queen Bed, 1 Twin/Double Bunk Beds, HOT TUB, microwave, D/W, W/D, 3TVs/2VCRS, DVD player, gas fireplace, gas BBQ, bikes, high speed internet access, close to mall & lodge. 1200 sq ft, 4 Star, 6 Unlimited SHARC passes. 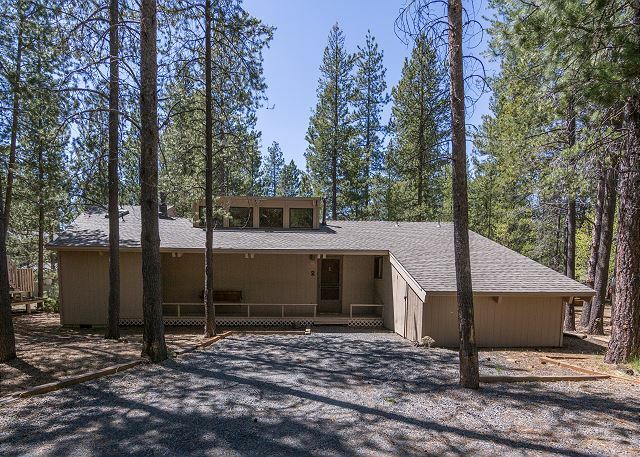 If you would like further information about this Sunriver vacation home or our property management services please call 1-800-541-1756. My kids and I had a wonderful time in Deer 2! It was warm and cozy with a highly efficient heater and gas stove. We all slept well in the comfy beds. The hot tub was clean, although some jets didn't work, we didn't mind because we just enjoyed soaking. We used the bikes provided and they worked beautifully! This home is well kept and very clean and well appointed! The location is perfect; close to the village but not too close. It's very quiet. There was one small issue where I felt the need to call the property manager. The maintenance guy was there within 10 minutes and the problem was solved! I would absolutely stay here again. Thank You for the beaming 5 star Review, Nikole! We are so glad to hear that you loved this home and that you were comfy, warm and in a great location. We are here to help and it sounds like when you needed us we were there quickly! Come back Soon! Great little house within walking distance from the village. Our family had a great time staying here. Thank You for the beaming 5 star review, Brian! Glad to hear that you and the family had a wonderful time, we would love to host you again! Thank You for the wonderful 5 star review, Sean! Glad to hear that you loved the location and that the home was very clean, Come back Soon! Easy to find and convenient location. House was a nice getaway for Christmas including snow on Christmas Eve to give us a white Christmas. House was clean and well kept, we're looking forward to going back! Thank You for your 5 star Review, Ian! We are so delighted that you had a wonderful stay and a white Christmas too! Hope to see you again soon! Deer 2 was just what we had hoped for. Its close location to the Village made walking there easy, it's hot tub was clean and delightful, and the layout of the house worked well for our kids to have one end of the house and the adults to have the other! Thank You for the 5 star review, Mica! 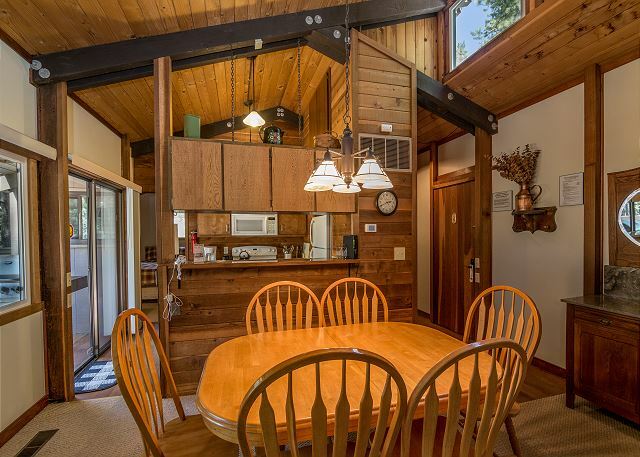 Deer 2 is a GREAT location and it's split floor plan is wonderful. So glad you were able to get some relaxation in while you were here, We hope to see you again in Deer 2! Amazing location for our young kids and dogs. A short ride to the village or pool and also able to access all the beautiful trails for longer rides. Outside area was peaceful and we even had a mama blue jay and her nest. Thank You for your review, Sarah! We hope to see you in Sunriver again soon! My wife and son needed a place where we could bring along our dog, and the Sunriver environment was great for having a place where we could accommodate him and enjoy the outdoors. Hi Peter, We are thrilled you enjoyed your stay. Sunriver is very dog-friendly and we have many homes to accommodate our furry friends. Please visit us again soon in Sunriver! The house was great for a 3 day ski getaway. 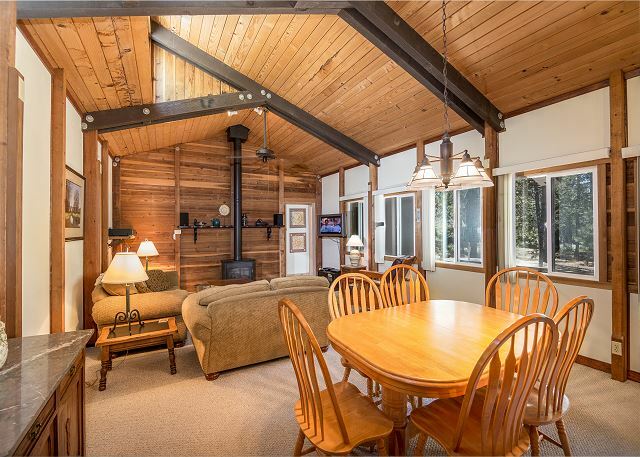 Very cozy and great access to the highway to Mt Bachelor. The ice on the back deck near the hot tub and the driveway was a little treacherous at times, but the house was perfect for the three of us and had a great winter cabin feel. Tom, we are so delighted that you enjoyed your 3 day ski getaway at Deer 2. We have been hit hard this winter with a lot of snow and ice. In the future, please give us a call and let us know if you have any concerns about anything you find unacceptable. Here at Sunset Lodging, we always strive for 100% satisfaction and would of gladly came right over to see what could of been done about the ice. We hope you choose Sunset Lodging in the future and look forward to your return. The location was great,but the House could use a little maintenance. Minimal lightning in two of the bedrooms, cobwebs on the ceiling, and the DVD player didn't work properly. I would recommend this house but with a little bit of upkeep. We're sorry you ran into maintenance issues at Deer 2, Janet. Cobwebs are not ok, so if you run into any housekeeping issues when you come to stay with us, PLEASE just give us a call and let us know, so we can come out immediately and fix them. We know how hard our visitors work for their vacations, and we want them to be perfect and perfectly comfortable. We'll take a look at that DVD. Lighting in bedrooms is a tough one because half of our visitors want dark bedrooms and the others want light. So to solve for this, we keep reading lamps in our warehouse and deliver them to anyone that needs more light in their home. Feel free to always call us on these things while you are here, we've likely got a solution every time!. Thanks so much for your valuable feedback and giving us the chance to get better. We are a family of 5 and enjoyed our stay in Deer 2. 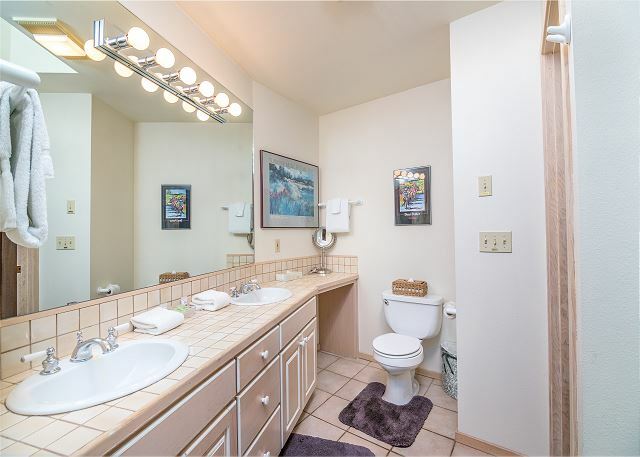 The property is very centrally located and had everything we needed. Enjoyed the hot tub, bikes, sitting outside on the deck and the SHARC passes. Sunset Lodging were great as well, after hours the BBQ ran out of propane but they answered our phone call and delivered a new propane tank in less than 15 minutes. We would stay here again! The location of the property is ideal. Just a short walk or bike ride to the village center. The home is older, but well maintained inside and well equipped with nice furnishing and all the amenities needed for our stay. Came with 6 SHARK passes and a good variety of bicycles. it has a huge deck with table, chairs and BBQ. All in all, we thoroughly enjoyed our stay and will go through Sunset Lodging for our next trip. great spot, we enjoyed the hot tub, the house was just right even though it rained! This place was clean and very accommodating. Had all of the cooking utensils and dishes needed, to make a few good meals; which was helpful because the restraurants at the village were always packed. Bed was comfortable. Wi-fi worked well. Walking distance to the village. Only complaint I have, which is very minor, is that the TV in the living room did not work and was outdated. Overall, a great place to stay for a family getaway. We'll take a look at that TV, Travis and thanks so much for the feedback. We hope you'll get back to Sunriver soon! One of my favorite places in Sunriver so far. Very close (but not too close) to just about everything - a 5-minute walk to the village. My favorite part was the huge deck on the back of the house, perfect for sitting in the afternoon sun. Not too big or fancy, just right for small family with kids. At first I felt like the house was just too small but during the stay the place really grew on me. While small, especially the kitchen, I liked the split bedroom layout, the deck is really nice and the hot tub is part of the deck area as opposed to being on a different floor or around the side of the house. 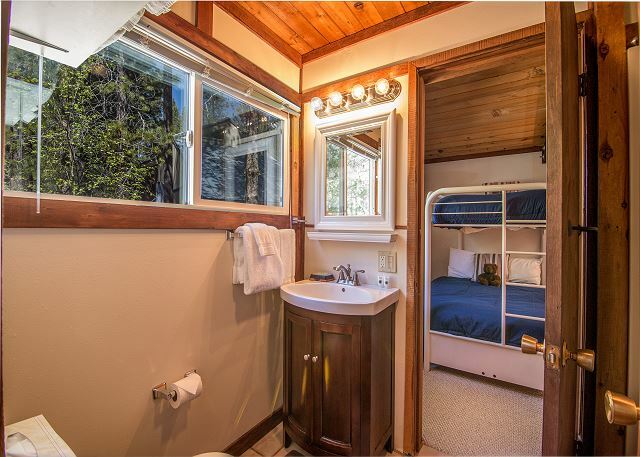 This house has a very "cabiny" feel, nice furnishings and a spacious main bathroom. The jack-and-jill bath between the 2nd and 3rd bdrms is quite small. The front windows bring in the morning sun and it was nice to spend evenings on the west-facing deck. It was a great house for the 5 of us. THANK YOU for the unlmtd SHARC passes... a huge plus. Thank you for the feedback, Heidi! We are always glad to hear our guests enjoyed the layout of a home (ps - 'cabiny' - LOVE IT! Perfect word to describe the house.) There is something very cozy about our Deer 2 and we hope you'll come back soon. Glad you got to visit the SHARC! This house was perfect for our mini vacation with the grandkids and mother in law. Its close to the mall, really enjoyed the lounging on the large deck. We will definitely stay there again. So glad to hear it, Teresa! Call us when you're ready to come back, we'll look forward to your next visit! Great location near village and walking/biking paths. House has an interesting layout with master bedroom & bath on 1 side and second bedroom and kids bedroom sharing a bathroom behind kitchen. This worked well for us. 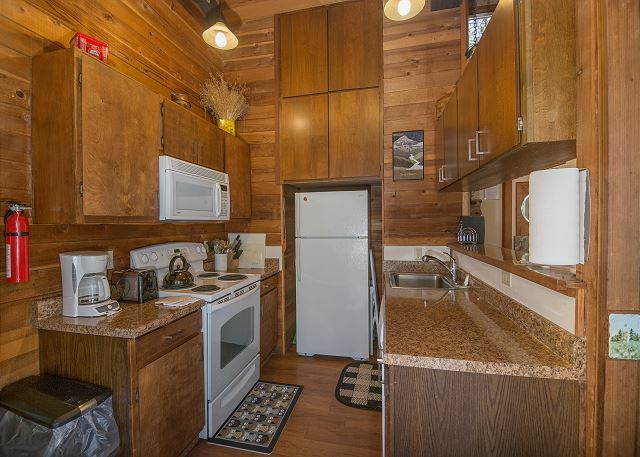 Kitchen is small, but the "great room" was open and inviting. House is a bit creaky, bikes need tuning, and a few things weren't working properly (But, Sunset Lodging was very quick to fix everything--GOOD Service, thank you). Our last morning there we returned from a walk to find the thermostat temporarily not functioning and the house filled with the strong smell of gas. We opened all doors and windows. There may have been a delay in the ignition of the furnace. Anyway we opened all the windows, vacated and called maintenance who could find nothing specifically wrong when he arrived. Enjoyed this cozy little home. 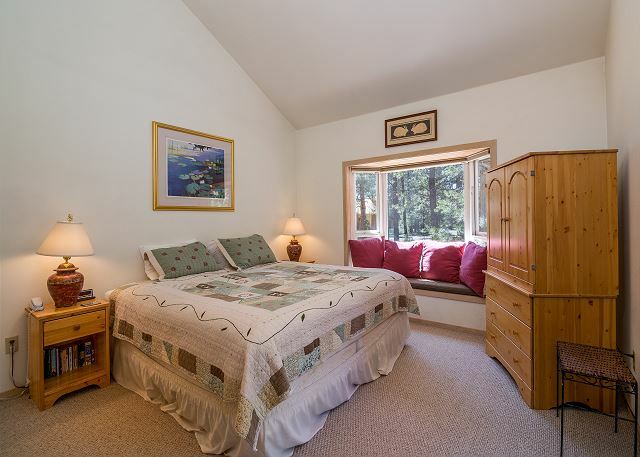 Easy location to get in and out of Sunriver quickly, and spend more time on the slopes! The kiddos (age 8, 6, 5) enjoyed the twin over double bunk-room with their own tiny TV with lots of kid VHS movies. Nice stereo for adults. Warm gas stove. For the price, I was more than happy with this place!! Lots of coat hooks everywear for cold/wet ski gear.